There’s a quaint little no frill bakery located in Little Italy that’s worth the visit. One thing that irked me were the weird hours(closing early on Saturdays and not even open on Sundays)… being a full time student up at UCSD and working in Sorrento Valley makes it hard to come down to Little Italy in time on the weekdays as traffic on the 5 is crappy like around 5 or so. However the store has recently changed their hours to stay open later on Saturdays and open at least half the day on Sunday so now I can visit more often. The bakery seems to be split into two sides. One side is responsible for serving several lunch items like pastas and sandwiches which I have yet to try. While the other side which all the warm sweet aromas are emanating from, the bakery is what keeps me coming back. I tend to have this habit of trying something that I like and then its hard for me to try something new from the same shop. At Solunto’s this happens to be the cannoli($1.50 for small and $3.00 for large). 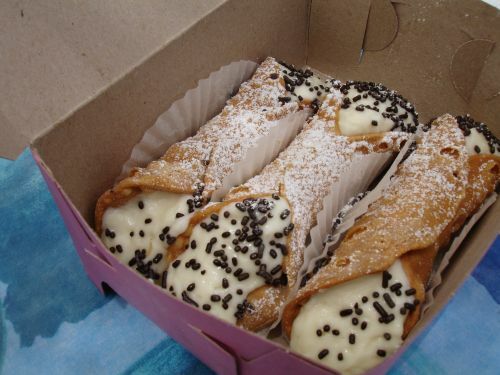 It consists of a fried pastry shell filled with cannoli cream which in this case tasted like a blend of marscapone and ricotta cheese, sweetened with sugar and flavored with vanilla. The pastry is then finished with chocolate sprinkles and powdered sugar. This tasty treat is sinfully rich and yummy… the crunchy pastry with the sweet silky cream is almost orgasmic. The ones picture below are large so if you still want to indulge but want to lay off on the calories you can go with the small which is about half the size of the large. 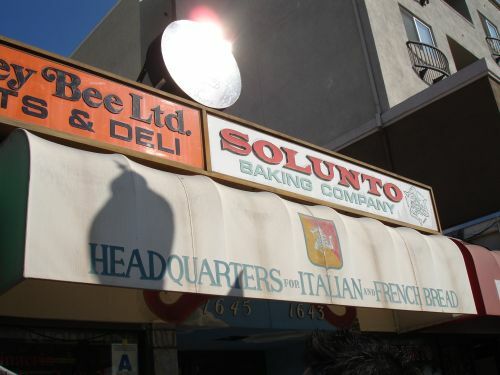 The smell of this bakery reminds of the bakeries I’d walk past by during class when I was in Rome…it even comes complete with the little old grandma/matriarch figure that bosses the other workers around and seems in charge of filling the cannolis with cream. For a little taste of Italy at an affordable price you should visit this place definitely. Solunto's recently remodeled/upgraded to an upper class restaurant similiar to their Italian restaurant's adjacent, Zagarella's and Buon Appetito. You wouldn't recognize the place! Also they opened a Pizza place next door, Celunto's, in the past year.